Creating BIM Content, Supporting Industry Change. In today’s world, new technologies are developed and adopted at astounding rates. This rate of change in technology has never been more apparent than it has been in the built environment industry over the past 10 to 15 years. In an industry that constructed over $1.16 trillion worth of buildings and infrastructure in 2007* yet had 25%-50% waste due to poor coordination**, $15.6 billion in losses due to the lack of technology interoperability*** and $4-$12 billion in losses due to contract disputes****, rapid change is underway to improve upon how these projects are designed, built and operated. At the core of this change is Building Information Modeling (BIM). With the promise of streamlined workflows, greater coordination, reduction in waste and higher quality products, BIM has revolutionized the way we approach contracts, design, construction, operations and supply chains of our projects. The Building Information Modelling (BIM) process (verb), at its most simple form, is the process in which technology is utilized to efficiently create, collect and leverage design, construction and operations data (and 3D geometry) amongst AECO (Architecture, Engineering, Construction, Operations) project stakeholders. At the center of this process is the Building Information Model (BIM) (noun). A BIM is an object-based 3D virtual representation (or model) of the building project. Rather than the disjointed 2D line drawings and hard copy supporting project documentation of the past, the BIM is an intelligent 3D model comprised of objects (walls, windows, doors, FF&E, etc.) that contain both the geometry for physical representation as well as the appropriate building data required to design, build and operate the building. With construction drawings and specifications, etc. extracted along the way, this building information model is then continually developed and leveraged (via the BIM process) by all AECO project stakeholders throughout the design, construction, handover and facility operation project phases. For another look at BIM, see the "What is BIM? Short and Simple" article here. As you can imagine from the above, a building information model is only as useful as the accuracy and usefulness of the data and geometry of the objects that are leveraged to create it. The process of ensuring that these BIM objects contain the appropriate building information and are accurately represented geometrically starts with the product manufacturers who are making these products available to the AECO project teams. As AECO teams design, model and build their building models with the BIM objects provided by the product manufacturers, these BIM objects begin to establish the solid foundation of building information that a project will be built upon as well as work as virtual sales agents for the product manufacturer as product make, model, specification information, etc. is already included within each object. At NELSON, we help product manufacturers collect, analyze and migrate the appropriate information from their production and marketing environments into these small, compact yet intelligent 3D BIM objects. 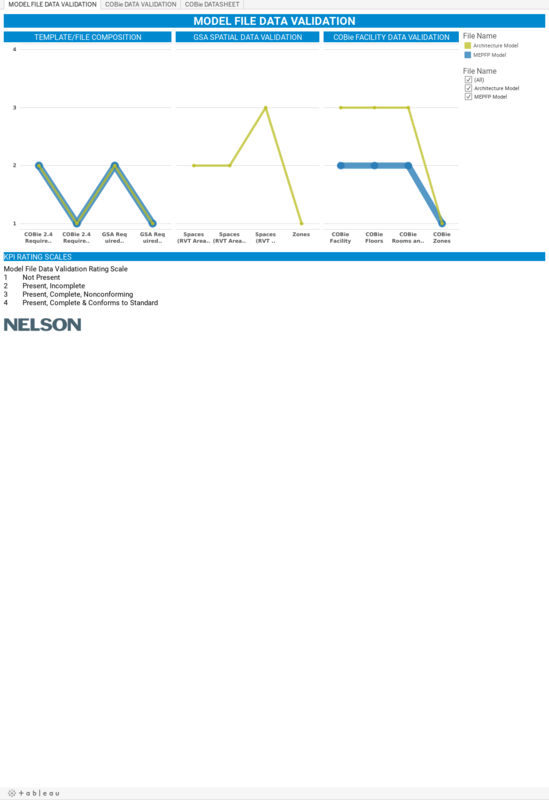 NELSON, at our heart, is a design firm comprised of hundreds strong BIM users that use these BIM objects every day. We are well equipped from an AECO team player as well as a technical/subject matter expert standpoint to assist in determining the appropriate levels of information to be included in a manufacturer’s BIM objects as well as the level of detail of geometry necessary to ensure maximum value. Firstly, a broad all-encompassing reviw of all products within a manufacturer’s catalog is performed to determine the level of effort and resources that may be required to develop BIM objects for products across all product lines. With some organizations, the sheer quantity of products that an endeavor like would entail can be daunting. Based on the findings in the catalog review, an implementation strategy is be developed that will best take advantage of budget and time requirements while working to meet organizational goals. This strategy also outlines the most efficient way to structure object libraries as well as establish an ecosystem that is both incrementally implementable as well as scalable. Through various reviews and exercises, relevant information is gathered from production, pricing and marketing materials to include in the BIM objects. Based on the findings during Information Collection, a common set of data parameters is be developed to be included in all BIM objects; parameters such as warranty information, contact information, costs, materials and configuration/size changes. In addition to product specific data, additional parameters may also be suggested based on industry trends and/or relevant design standards such as UniFormat/OmniClass classifications as well as COBie and IFMA/OSCRE/BOMA information. The level of detail of the geometry is also key to ensuring that a delicate balance is struck between effectiveness of the physical representation of the product and the usefulness of the objects once loaded into BIM software. Many times objects are over modeled resulting in performance issues once loaded into a building information model. The broad holistic, 'entire-catalog' approach taken ensures that all information collected, analyzed and ultimately included in the BIM content as well as appropriate geometry requirements are consistently distributed amongst all products. As the execution of the strategy begins, a small sample set of models is presented for review and approval. The visual representations of the models as well as their embedded information is reviewed and revised as necessary to ensure the best, accurate and consistent quality moving forward. Throughout the process so far, behind the scenes, all library structure, model data and geometry requirements have been continually documented and revised. Once the small sample set is approved, a “Content Style Guide” is produced that defines the workflow processes, data types and object classifications that has been established throughout the process. This is leveraged as a guide for delivering consistent BIM objects through the remainder of the strategy. Think of the Content Style Guide as the blueprint for the development of BIM content for all products. Utilizing the Content Style Guide, the remainder of the product lines in the current phase of the strategy is created. Final deliverables can be delivered in a variety of formats and configurations to conform to requirements of an organization’s distribution methods (i.e. online via website, 3rd party distributor or app). Once the Content Definition and Pre-Deliverables phases are complete, additional product lines can be developed at a quicker pace as the information collection and analysis has already been completed and documented at a high level in the Content Style Guide. After significant delivery, to ensure that the best value is received for the investment, services such as BIM object updates based on product design changes, software version upgrades, as well as conversion of measurement units (Imperial to Metric, vice versa) can be provided to create an on-going partnership. What is BIM? Short and Simple. BIM has revolutionized the Building Design, Construction and Operations industries through the power of 3D visualizations and embedded information. This evolution has allowed AEC professionals to become more productive and efficient in their processes. Traditionally, the building design and construction process has been largely conducted via two-dimensional drawings (plans, elevations, sections, etc.). Building information modeling (BIM) extends beyond 2D and 3D drawing based design, augmenting the three primary spatial dimensions (width, height and depth) with time as the fourth dimension (4D) and cost as the fifth (5D), etc. Essentially, the building information modeling process builds a building virtually, complete with a 3D geometric representation and in-depth product and building material data, before it is physically built. This helps design and construction challenges be more likely to arise during digital design rather than in the field during construction. A building information model is built as a compilation of "objects” that carry their geometry, relations and data attributes. Instead of creating a set of drawings to produce pages of a construction document set, with BIM, drawing views are extracted (think of digital snapshots) from the 3D model. Construction drawings are simply a bi-product of creating a digital building information model. These different drawing views are automatically consistent with each other, being based on a single definition of each object instance. BIM also defines objects parametrically; that is, the objects are defined as parameters and relationships to other objects, so that if a related object changes, dependent ones will automatically change as well. For project teams, BIM enables a digital model to be handed from the design team (architects, civil, structural and building services engineers, etc.) to the general contractor and subcontractors and then on to the owner/operator; each professional adds discipline-specific data to the shared model(s). This reduces information losses that traditionally occurs when a new team takes 'ownership' of the project, and provides a very valuable and extensive wealth of information to owners of complex structures. Many owners are leveraging building information modeling (BIM) for design and construction. However, most aren’t benefitting from the rich data in the model when it comes to facilities management. Using BIM within a facilities management system allows users to reduce maintenance costs, save on future construction with an accurate model, and link existing systems to modeled information. Facility executives can derive more value from BIM within their facilities management system with these steps. BIMtionary Lookup: Take a gander at the BIM Blog World. Design Technology Manager, BIM Evangelist and Revit Super Hero striving to foster successful collaborative BIM/IPD ecosystems. Specializing in strategic and technical design application implementation, training and support.